It’s said that Citrine was one of the twelve stones in Aaron’s breastplate (Exodus 28:17-21). Of course, since there are no photos from that era and some stones have had their names changed, we can’t really know for sure. But it makes a good story and shows the importance of gemstones even early in man’s history. As best as anyone can tell, the origin of the word Citrine is from either the old French word for yellow or the Latin word citron, which is one of four original citrus fruits. Known as the “Merchant’s Stone” or “Success Stone,” Citrine is said to boost sales. Tuck a piece into the cash box or carry one in your pocket and attract the optimism of sunshine. Citrine energizes the solar plexus chakra, promoting peace in group settings, whether family or work. It increases self-esteem and energy while attracting opportunity. Healers use Citrine to help with digestion, relieve depression, and promote clear thinking. It’s a cheerful, hope-filled stone, sucking away negative energies and boosting self-confidence. Unlike many healing stones, Citrine never needs cleansing. Citrine is popular in pendants, earrings, and rings, as rather large and flawless pieces can be readily found. Wear it touching the skin for best results. This entry was posted in Sunday's Gem and tagged birthstone, citrine, gemstones, healing gemstones. Bookmark the permalink. Debbie, first, I love that quote at the top of this post, it’s so true! Second, I found this post VERY interesting because even though I am familiar with citrine and its healing energy, you shared a lot of information that I didn’t know. Yup, that’s right. I practice a form of energy work (called Reiki), which focuses primarily on the seven main chakras; each one pertaining to a different physical, emotional, and spiritual issue. Also, each chakra vibrates to a different color; the solar plexus being YELLOW. Really enjoyed this post, my friend. Have a super Sunday! Thanks so much, Ron. I remember your talking before about practicing Reiki, and I find that just fascinating! There’s so much information available, and it must be so gratifying to be able to help folks heal naturally. I gave my wife some earrings and a teardrop necklace made of jade colored Citrine. She loves them. Ooh, that must have been even harder — well done, John!! I have a lovely citrine ring! You’re so fortunate, Suzi — I’ve never seen a Citrine ring, but it must be gorgeous. I bet you feel happy and optimistic when you’re wearing it, too! Wow! What a great story. I have never paid much attention to this gem before but I will now! Who couldn’t use the attributes of this gem in their life. Love the quote too. Thanks for sharing. Thanks, Katybeth. My birthday isn’t in November, but I really like Citrine. And its range of colors means it appeals to a vast number of tastes. I guess anybody can successfully wear Citrine, unlike with Opals (which are only supposed to be worn by those having October birthdays). I like it, the sudden! Must get one for the collection. Thank you, Professor. Next time, I’ll have to feature a red gemstone, since that seems to be your favorite color! I’ll have to feature peridot one Sunday, Linda. ‘Tis a gorgeous stone, and you’re blessed to have one…especially your mother’s! I know what you mean about the challenge of wearing lovely stones with work garb, though. Since I do most of my work online, I don’t have to “fancy up,” yet I can’t bear to part with my gems!! I love citrine, though oddly I haven’t (yet) acquired any! Actually I love yellow in general – such a happiness-inducing colour! And I definitely find it energising – I have my spare room painted yellow – a hangover from the days when I used it as a home office. Great post, Debbie – enjoyed it! I agree, FF — yellow is a most cheerful color. My best childhood friend had a yellow-decorated room, and it was always a treat to go visit there. (Mine was pink — can you believe that?!?) Anyway, I made that Citrine bracelet pictured, and I just love wearing it…something about the nooks and crannies in the polished stones that I find soothing. Definitely, you need some Citrine jewelry! Thanks for reading and for your lovely compliment, Christy. 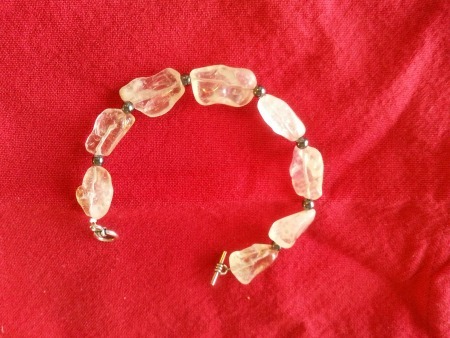 The Citrine bracelet pictured is one I made…for myself…and I love the way it feels on my arm! Oh all the power and positive energy you must feel when wearing this bracelet – especially wearing it at a pulse point. It’s lovely, Debbie. I’m a Reiki practitioner and love learning more about gem energies. Personally I dabble more in aromatherapy as a compliment to Reiki sessions, but gems keep crossing my path in the last few months. Personally I’ve been focusing on my solar plexus chakra lately, love imagining its sparkling, swirling yellow and learned new things today about citrine from your post. I thank you for sharing these snippets of information and wisdom. Barb, I didn’t realize you’re a Reiki practitioner — how fascinating that must be! Yes, I do love wearing my Citrine bracelet — its sunny yellow color and the smoothly rough stones make it an ideal “worry” stone.